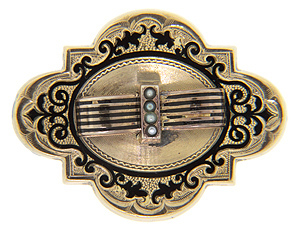 This lovely antique pin is crafted of 14K yellow gold and has ornamental black enamel accents. The center portion is slightly raised and has four seed pearls set vertically in a line. Detailed hand-chasing can be found all over the brooch, but is particularly noticeable around the edges where it contrasts with the enamel. The pin is 1 3/8” wide and slightly over 1” in height. Circa: 1870.